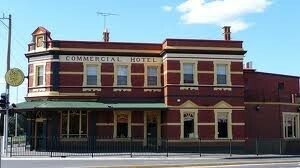 For a delicious meal, great live entertainment and a family-friendly atmosphere, you can't go past Commercial Hotel. Featuring a sports bar and Family Bistro with kids play area. There is an extensive and affordable menu to suit all tastes and budgets. The $12 express lunch menu is a hit. From 11.30am-2.30pm on weekdays, patrons can order chicken parmagiana, fettuccine carbonara or crumbed calamari with chips and salad, to name a few. On Steak night Tuesdays, a tender 250 gram grazier's rump steak served with chips and salad and your choice of sauce is only $15. On Thursday nights, drop by to try one of the parmas of the world with chips and salad for $15. In the sports bar, there is a $12 bar menu for lunch and dinner. World pro poker is on Wednesday from 6pm. First On Fridays is our party night with drink specials and D.J pumping out the music till 1am.